In Cupertino, you control the list of assessments and their interpretations. 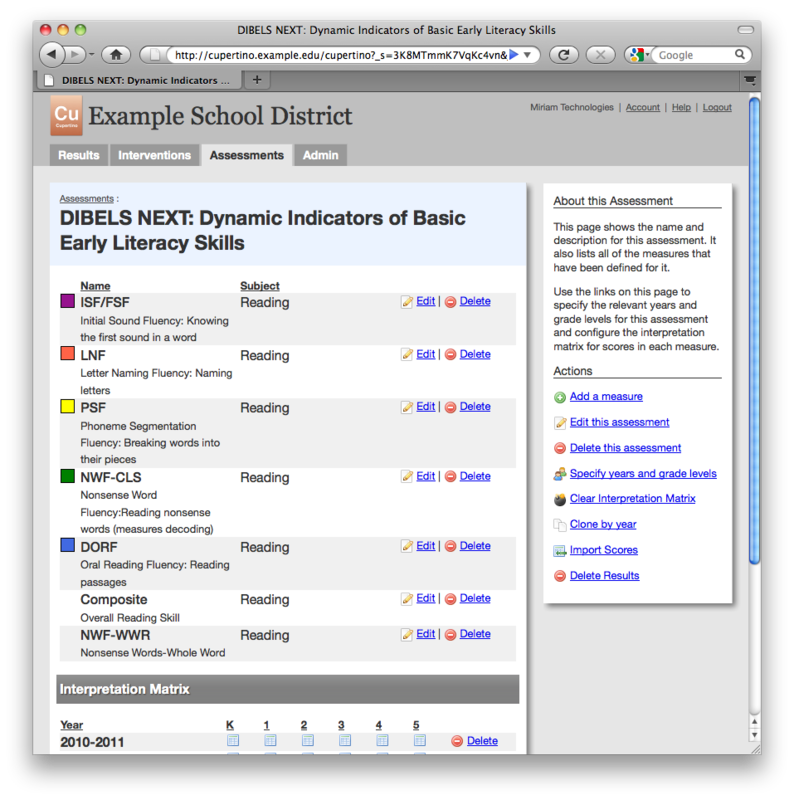 As an administrator, you can add or change assessments from your web browser. There are no limits to the number of assessments that you can track, and there are no hidden per-assessment fees. 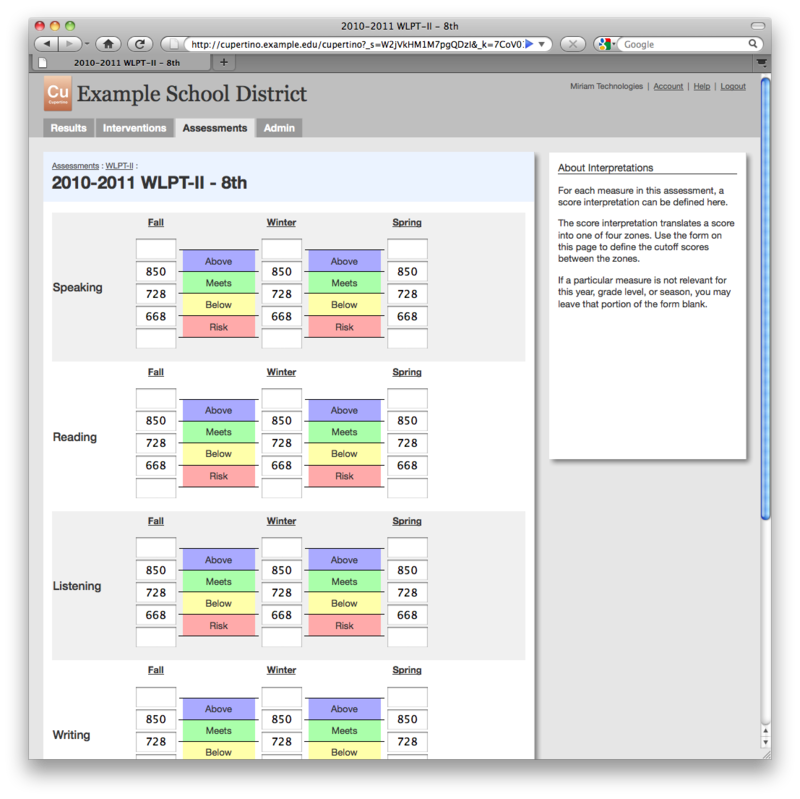 You’re free to manage the assessment list in the way that works best for your district. In Cupertino, each assessment is comprised of one or more measures: sub-parts of the test for which scores are reported. The measures each belong to a specific subject area (Reading, Math, etc.). That means that you can add assessments that cover more than one subject, as well as tests that use multiple measures per subject. After you’ve added the assessment and defined its specific measures, you can set up cut scores for each measure to separate students into 4 groups: Above Standard, Meets Standard, Below Standard, and At Risk. Cut scores can vary by grade level, season, and school year. Speaking of seasons: you can have as many as you want. Cupertino isn’t limited to 3 benchmark points, though many districts test in the Fall, Winter, and Spring. But if your district schedule runs on 4 quarters instead, we can set up your system to match whatever schedule and naming conventions you’d like. Because you control all aspects of the score interpretation, you can use Cupertino for any kind of assessment that has numeric scores: standardized tests from private vendors, state tests, district-specific screenings and even AP Exams. As soon as an assessment has been set up, you can start entering scores. And once the scores are in, they’ll appear on your graphs and reports automatically. Every change you make is immediately activated for all users in the entire district.